Attractive product labels reflect your brand's value and influence consumers to purchase one product over another. Professional color label printing often means placing a large order with a commercial printer. Rather than ordering more labels that you need at a significant cost, solve your labeling problem once and for all with the Primera LX400 color label printer. The Primera LX400 prints high quality, high resolution color product labels on demand – all at a price even the smallest manufacturers can afford. A large variety of label sizes, shapes, and materials are available specifically for printing product labels on the Primera LX400 color label printer. Best of all, the LX400 printer is easy to use. Everything you need to get started is included with your Primera printer order including label design software, ink, and a sample roll of blank product labels. Food labels – Give your baked goods, gourmet and specialty foods, desserts, pies and cakes, nuts, candy and confectionary, produce, and organic and natural foods the labels they deserve. Labeling cans and jars – Make a positive impression with colorful product labels for honey, jams, jellies and preserves, sauces, and salsas. 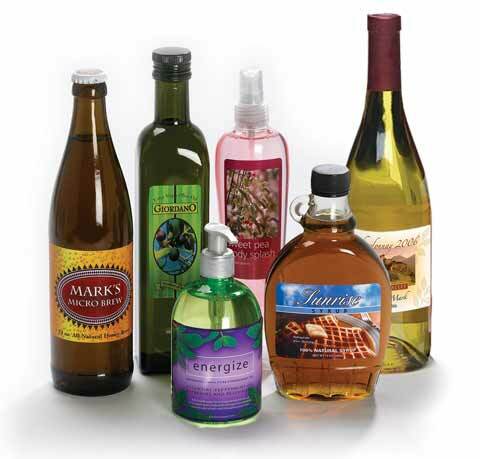 Bottle labels – Label bottles of juice, cider, syrup, water, wine, beer, and spirits with elegant Primera labels. Pet food labels – Use the Primera LX400 to create stunning color labels for pet foods and snacks. Labeling candles, gifts and gift baskets – Whether you want to brand your items or offer custom labels, the Primera LX400 makes doing so a snap. Personal care and cosmetic product labels – From soaps and shampoos to lotions, makeup, and lip balm, your products deserve beautiful labels with water and oil-resistant properties. Labeling vitamins, supplements and nutriceuticals – Crisp graphics and high resolution printed labels help your products stand out from the crowd. Labeling oil bottles (essential and olive) – The Primera LX400 is capable of creating tiny labels for essential oils and aromatherapy products. Labeling chemicals and cleaning supplies – Make an impact with visually appealing Primera labels. School stickers – Create branded labels for school spirit wear, library books, visitor badges, and more with a Primera LX400 printer. 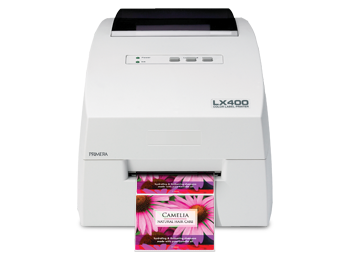 The Primera LX400 color label printer is an easy-to-use, low cost solution for printing gorgeous labels on demand. It is available from Optimedia Labs, your one-stop source for label printers and supplies. Create your own high resolution product labels without the hassles and minimum order requirements of commercial printers by ordering a Primera LX400 printer today.